It’s no problem to figure out the link between crayons and coloring books, but how do maps fit in? This passage from the book I am reading now, The Winter Sea by Susanna Kearsley came at me like a Mac truck in heat, finally legitimizing the box of Crayolas, 64 count no less, I’ve been harboring for the last year. Summer in my childhood was coloring time. I used to sit on the front lawn, under the shady elm tree, coloring book in my lap, crayons in my stubby-little fingers. I remember how my mind would get lost in the colors in the box and the need to pick out the absolutely perfect ones, the challenge of ‘staying in the lines’ (I was never as good as Stacy Fidler at that), and the pride engendered by the finished product. Coloring like that was a process that was pure Zen. I lost myself, totally. I stuck my tongue out, unconsciously, I hummed nursery rhymes, unintentionally. Coloring was about being and it was really cool and vibrant! 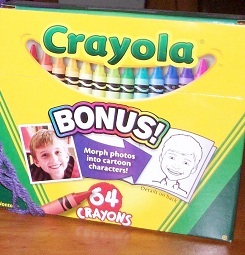 My 62-count box of Crayolas is now anxious to be dusted off, opened, and used. Or, shall I say, my brain is anxious for me to dust off my 62-count, find a map, and start coloring.